George Weigel in his conversation with Patrick Coffin compares the Pell case with the sensational Alfred Dreyfus case that occurred in France 1894-1996. It is a just comparison. The sentence of Cardinal Pell has, as expected, sent Australia’s media sewer rats scurrying from their dark infectious holes, crawling over each other to repeat Judge Kidd’s most inflammatory comments. But it is all a farce. For one thing, the inflammatory comments are based on a conviction vigorously disputed by appalled legal people around the world. What sort of a dodgy legal system does Australia have? I wonder how Judge Kidd felt while he was uttering his comments, knowing that Cardinal Pell’s conviction rested on the most flimsy evidence, that he was sentencing an innocent man to jail, perhaps to die in jail, and he was giving support to Australia’s implacable religious and political bigots. This most egregious miscarriage of justice has not finished by a long shot. Indeed, it is a major event in Australian history and will be examined ceaselessly. When all the stakeholders are gone and balanced historians examine the evidence, the real scoundrels will appear to take their place in nation’s rogues gallery. The character of Madame DeFarge in Charles Dickens’s A TALE OF TWO CITIES is the (UK) Telegraph‘s Daisy Bowie-Sell’s favourite Dickens character. Cardinal Pell is being held in a prison in Melbourne, Australia. He awaits his sentence on March 13. He has appealed against his conviction on five counts of sexual abuse, allegedly for acts committed in 1996 or 1997. What has happened has shocked and hurt many people, especially Catholics. The general feeling is one of disbelief and surprise. Nine months ago I had lunch with Cardinal Pell in a simple restaurant near his home in Sydney. From what I have read these days in the press, I realize now that he was already aware of the accusations formulated by the former choir member of Melbourne Cathedral. At lunch we talked, among other things, about the reason for his return to Australia; he told me that he wanted the truth to come to light, as he has repeated many times. And the truth, as he has also repeated on countless occasions, is that those events never took place. During that meal I realized that he was already prepared to suffer what is now a reality. The Sydney Morning Herald reported (5 March) that Cardinal Pell’s experienced and highly successful barrister Robert Richter will not be part of the team acting on behalf of the Cardinal in the appeal against his conviction. Richter is quoted as saying he does not have ‘sufficient objectivity at this stage’. It was rare show of public emotion from one of Australia’s leading criminal lawyers, who usually comes across as unflappable in his devastating defence of his clients. Robert Richter’s reaction says much about the process of Cardinal Pell’s conviction. With the exception of Alan Jones, 2GB’s presenters have been disappointing in their commentary on the Pell conviction about which I will have more to say in subsequent comments. Jones’s comment made on his Sky News program is brilliant for its succinct coverage of the main points of Cardinal Pell’s defence. of ‘Multiple charges’ what remained? What remains of credibility? Multiple charges made against Cardinal Pell for historic sexual abuse were scheduled for a committal hearing in March 2018. Some charges were withdrawn before the hearing and some during the hearing. Magistrate Belinda Wallington dismissed all but six of the charges, five by the one complainant. Those six were to go to trial. In February 2019, the one charge by one complainant was withdrawn by the prosecution. There was no hope of conviction. The Age newspaper, which has been in the forefront of the unrelenting and unmerciful media attacks on Cardinal Pell, posted excerpts from the police interview with the Cardinal on youtube (see below) detailing the charges for which he was convicted last December. I offer an analysis of the complainant’s claims. We first see the Cardinal listening attentively to the police interviewer as he reads an account of the boys’ action leading to the alleged abuse. The boys found their way to the sacristy at the back of St Patrick’s Cathedral. The Cardinal interrupts to ask which sacristy the interviewer is talking about, that is, in which sacristy the boys found the altar wine, the Archbishop’s sacristy or the priest’s sacristy. The Cardinal now wears a sceptical expression. The interviewer is stumped for a moment. He obviously doesn’t know there was more than one sacristy. The interviewer says it was presumably the Archbishop’s sacristy where Pell at the time would have vested and unvested. This is the first howler. The Cardinal says no wine is kept in the Archbishops’s sacristy. 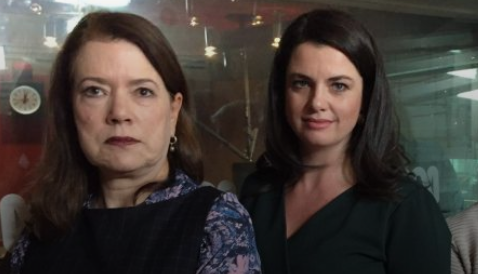 The ‘heart-on-her-sleeve’ Louise Milligan poses with Melbourne Magistrate Belinda Wallington who subsequently sent Pell to a Supreme Court trial after a committal at which Milligan testified. This chummy photo was taken after both appeared on Jon Faine’s ABC radio program. Faine is not known for his impartiality towards Cardinal Pell or the Catholic Church. The photo is a selection of illustrations and photos to demonstrate the bigotry that turns Pell-haters inside out. The following crippling review by Julia Yost appeared in First Things on 7 March 2017. George Cardinal Pell was charged last week with multiple counts of sexual abuse of children. He currently resides in Rome, tasked with cleaning up the Vatican finances. In the coming weeks he will fly to his native Australia, where he vows to fight all charges. His successor in the see of Sydney, Archbishop Anthony Fisher, advises letting the justice system take its course.